Powers/Abilities: A Growing Man is a stimuloid (specialized android) enhanced with growing particles from the dimension of Kosmos. It absorbs most forms of kinetic energy and increases its mass, replicating and multiplying its artificial cells and increasing its strength and mass proportionately. The mass may be drawn and sent back to the dimension of Kosmos, much like that of Giant-Man or Atlas. No limits have been shown to the size Growing Man can achieve. A Growing Man has been defeated by damaging its inward components, causing it to shrink instead of grow or damaging its growing mechanism. 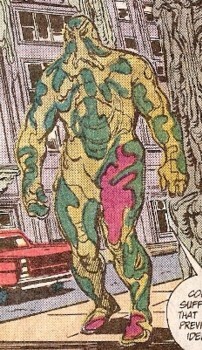 While generally subservient completely to Kang, a Growing Man has been programmed to follow others, most notably Hydra. A Growing Man is capable of sending a beacon across space, time, and dimensions to Kang or the Kosmosians. One Growing Man, when hit, split into over a dozen doll-sized Growing Men. (Young Avengers#2 (fb)) - When a young Kang in the far future carried his remote-controlled stimuloid (a prototype of the Growing Man) to school, Morgan and other bullies grabbed it. Just as Kang moved to activate it, his future adult self came back in time to stop the fight, altering history. Young Kang went on to become Iron Lad, who went back in time in an attempt to change his life to something different. (Thunderbolts I#13 (fb) - BTS) - In the far future, the world conquering Kang took over the dimension of Kosmos, forcing the insectoid Kosmosians to build him a series of stimuloid robots, calling them Growing Men, to use as weapons in his ongoing conquering efforts. (Thor I#140 (fb) - BTS) - Kang hid his powerful Growing Man, doll-sized, in the distant past in New York City, planning on calling him forward when he was needed. A museum expedition unearthed the doll-sized Growing Man and, shocked, called the authorities to investigate. They saw it grow overnight, likely due to being moved, to the size of a man. (Thor I#140) - The baffled authorities realized the Growing Man was warm to touch. When one man struck it, the Growing Man awakened, knocking the humans aside and growing from their gunfire. He batted his way outside, seeking his master, needing to find his purpose. Growing Man wandered aimlessly, destroying parts of the city, and not caring that he was continually growing. When the police surrounded it, Growing Man batted them aside with a tree until finally Kang approached, hitting Growing Man with a de-energizer and returning him to doll size. The authorities surrounded Kang, so he sent the man-sized Growing Man at them again. Thor attacked, striking Growing Man repeatedly, then making it grow exponentially due to a blow from his hammer. Knowing that the Earth itself was at risk, Kang deactivated Growing Man and sent it back to the future. (Thor Annual I#17/4 (fb)) - Kang took a Growing Man to the far future and used it to defeat his wayward army, putting him back in power. (Avengers I#69) - Kang sent a doll-sized Growing Man to a New York hospital to kidnap Tony Stark. Growing Man was tossed in the garbage by the Wasp, who'd found it on the floor. The impact activated it and sent it charging for the room, batting aside guards, including Tony, and growing from their gunfire. The Avengers (Captain America, Goliath, Thor, Vision, Wasp, Yellowjacket) tried to stop it, but it merely grew taller from their efforts, bursting through the wall with its captive. Goliath tried growing big enough to stop Growing Man, but the growth strained him. Growing Man returned to human size and summoned Kang, who brought him aboard his ship in space. (Iron Man I#110 (fb) - BTS) - A group of Rigellians found Kang's wayward ship and sent the canister containing a Growing Man to Earth, to attack the humans when he was awakened. (Iron Man I#108) - Employees of Tony Stark callously tossed aside the metal unit, freeing Growing Man. When the startled men attacked it, Growing Man easily batted them away. Unable to call out to Kang, it went into Stark's plant, sensing a greater power source there. Plowing through a Titanium door, Growing Man knocked two guards aside, then grew furious when Iron Man, Yellowjacket, and Jack of Hearts tried to stop him. Growing Man grew right through the roof, punching Iron Man back with his increased bulk. It reached in the building and grabbed the power source, but Iron Man made it grow big enough to break into Growing Man's mechanical brain, where he drained its power, returning Growing Man to normal size. (Iron Man I#109) - Jack of Hearts and SHIELD used a scanalyzer to track Growing Man to the Rigellians. (Avengers I#268) - When the Avengers attacked Kang's stronghold in Limbo, Kang sent Growing Man to fight them back. Growing Man got caught up in trading blows with Hercules, growing larger until Hercules tossed him through a few walls, damaging his components and rendering him inert. The other Avengers (Black Knight, Captain America, Captain Marvel, Sub-Mariner, Wasp) stood by. (Avengers I#300) - At Kang's command, Growing Man appeared at doll-size in New York, and was given orders to disguise itself, lead a group of loosely connected heroes to Franklin Richards (as the boy had been captured by demons), then destroy the demons' nesting ground. It then disguised itself in demonic ectoplasm, granting him a greenish hue. Using its scanners, it found the heroes (Thor, the Captain, Gilgamesh, Mr. Fantastic, and Invisible Woman) and posed as a demon, telling them to follow him to find Franklin. While knocking over buildings and walls behind it to stall the heroes, Growing Man made his way to the World Trade Center and scaled the building. The heroes soon battled and defeated the dozens of demons there, saving Franklin. When Growing Man tried to topple the building, Thor hit it with his hammer, increasing its size and deciphering its identity. Mr. Fantastic then reversed its mechanisms with an energy ray and the heroes struck it repeatedly, causing it to shrink out of sight. The heroes later became the Avengers. (Thunderbolts I#5) - Seeking revenge on the Thunderbolts, Baron Strucker of Hydra had weapon X-F3, which he'd had in storage for some time, released on New York City. Growing Man landed near Thunderbolts Moonstone and Jolt and he immediately demanded to see his master to find his purpose. As Growing Man punched the nearby humans aside, Moonstone struck it, causing it to double in size. Growing Man struck Moonstone as MACH-1 and Songbird joined the battle. Growing Man proved impervious to MACH-1's gas-missile, though Songbird's sound bubble did temporarily contain it. Growing Man grew more and more furious, demanding the master's location. Bursting out of the sound-bubble, Growing Man was attacked by Atlas and Techno. Atlas continued increasing his size, causing Growing Man to get bigger and bigger, and soon damaged the Growing Man's head with a mighty blow. The damaged Growing Man sent a message beacon out before falling to the ground, disabled. (Thunderbolts I#13 (fb) - BTS) - The beacon was received by the present-day Kosmosians, who learned that Kang would eventually conquer them. (X-Men and Spider-Man: Time's Arrow: Book 3: The Future) - When Spider-Man and several X-Men invaded Immortus' castle (called Tenebrae in the novel) in Limbo, Kang left his subordinate Lireeb (secretly a disguised Immortus) behind to handle the heroes. Lireeb sent four Growing Men against the invaders. Cable and Spider-Man trapped one inside by causing it to grow big enough that it couldn't leave the room it was in. Bishop defeated one by absorbing the energies that allowed it to grow. 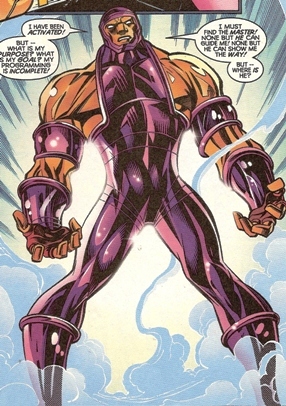 Iceman defeated the third by reducing its temperature to extreme levels. Finally, Phoenix (Jean Grey-Summers) defeated the fourth by using her telekinesis to turn it off. When the first managed to escape, Cyclops, Cable, and the other-dimensional Aliya overloaded it. 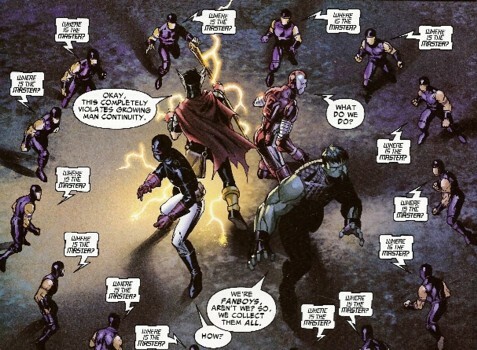 (Young Avengers#3) - Kang sent a giant-sized Growing Man to attack the newly formed Young Avengers led by Iron Lad. Also present were Captain America, Iron Man, and Jessica Jones. Demanding to know where his master was, Growing Man struck the ground but was swiftly knocked back by Hulkling, when he altered into dozens of small Growing Man dolls. The heroes worked to subdue the stimuloids until they recognized Iron Lad as Kang. They then all dissipated, contacting their true master, the adult Kang. Growing Man was immediately attacked by a demon, which he quickly destroyed as he grew. (Sentinel Squad O*N*E#2) - Retooled and recolored by Hydra, a Growing Man was sent to attack a political rally guarded by Sentinels manned by members of the O*N*E (including Nathaniel Briggs, Rajani Dhama, Alexander Lexington, Jake Slayton). 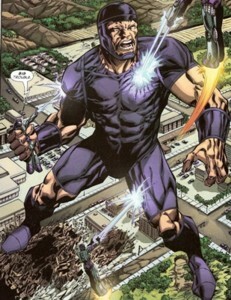 A Hydra agent activated Growing Man, who immediately began batting around the Sentinels and shaking off their blows. At giant size, Growing Man ripped the arms off one Sentinel and was able to hold another in its hand. Lexington used his hidden mutant powers to overload Growing Man, causing it to crash at giant-size. Slayton lost his legs in the battle. (Avengers vs. Agents of Atlas#1) - While visiting the old Avengers Mansion, young Brady saw a bizarre spectrum of colors filled with glowing heads, and found a Growing Man doll when the apparition disappeared. Brady immediately started playing with the doll, which started growing with small impacts. The Growing Man exploded out of Brady's car and said he must kill the Avengers, and he was immediately attacked by Spider-Man. After shrugging off Spidey's webs, Growing Man was attacked by the other New Avengers (Captain America, Luke Cage, Ms. Marvel, and Wolverine). He grew larger with each of their blows as the heroes tried remembering who he was and how to stop him. When Wolverine sliced off the Growing Man's hand with his Adamantium claws, the hero was pitched into the river, but the robot only grew larger when the Agents of Atlas (Gorilla-Man, Human Robot, Namora, Uranian, Venus, and Jimmy Woo) struck them with their ship's force beam. Namora then grabbed Wolverine and flew him all around Growing Man, claws extended, and the robot fell into pieces in the river. Growing Man received an entry in OHOTMU Update '89#3. Thanks to SQUEAK for the following information: Growing Man appeared in the novel "X-Men and Spider-Man: Time's Arrow: Book 3: The Future" written by Tom DeFalco and Eluki Bes Shahar, on pages 232-263.